Domaine Georges Vernay is better known for their sublime Condrieu wines made from vines that were planted over a 3 year period that took place in 1936, 1937 and 1938. Since 1970, Domaine Georges Vernay has been producing a small amount of Cote Rotie. The estate went through a rough patch for a while, but things turned around when Christine Vernay, the daughter of Georges Vernay took over the property. Georges Vernay passed away at the age of 92, May 19, 2017. He will be missed. Under the direction of Christine Vernay, they expanded their lineup of wines by introducing a new from the St. Joseph appellation. La Dame Brune. La Dame Brune shows the estates new feminine influence as the wine takes its name from the brown tresses of Christine Vernay. Starting with the 2009 vintage, Georges Vernay began farming using only 100% organic vineyard management techniques. In total the domaine owns 6 hectares of vines in Cote Rotie. Their best vines are planted on steep, hillside terroirs with granite and sand soils. All work in the vineyards is organic. They were certified organic in 2019. 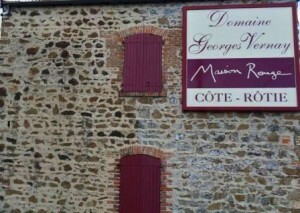 Domaine Georges Vernay produces 2 Cote Rotie wines. Domaine Georges Vernay Cote Rotie Blonde du Seigneur has a long history for the domaine, as it was the first wine produced at the property back in 1970. Today, they utilize 5 hectares of vines for this cuvee. But the name changed with the 2001 vintage to Blonde du Seigneur. The wine is made from a blend of 95% Syrah and 5% Viognier. However, the amount of Viognier varies, depending on the vintage as their vineyards have 8% of the white wine variety planted. The grapes, which are on average 40 years of age, are from the Cote Blonde. The vines are located in the southern portion Cote Rotie in the gravel soils found in the Bassenon, Maison Rouge and Lancement vineyards. The grapes are 100% destemmed. The wine is aged in an average of 25% new, French oak barrels for about 18 months before bottling. On average, close to 1,750 cases of wine are produced each vintage. Georges Vernay Cote Rotie Maison Rouge comes from about 1 hectare parcel of vines planted on the Maison Rouge lieu-dit, which is located on a steep, granite hillside in the southern part of the appellation. It’s quite close to Condrieu. The wine is made from 100% old vine Syrah, that is on average at least 90 years of age! 70% of the grapes are completely destemmed. Starting with the 2008 vintage, the wine is now vinified using micro vinification techniques, meaning that the wine is produced entirely in barrel. After alcoholic fermentation, the wine is aged in 50% new, French oak barrels for up to 24 months before bottling. Aging in wood started started with the 2009 vintage. Prior to that, the wines were aged in stainless steel tanks. Not much is made of this cuvee, as on average they produce close to 500 cases of wine or less per year. Domaine Georges Vernay, when young, should be decanted at least 1-2 hours, give or take, allowing the wines to soften and open their perfume. Older vintages might need very little decanting, just enough to remove the sediment. Domaine Georges Vernay is often better with 6-8 years of cellaring and should be at its best between 8-18 years of age. Domaine Georges Vernay is best served at 15.5 degrees Celsius, 60 degrees Fahrenheit. The cool, almost cellar temperature gives the wine more freshness and lift. Domaine Georges Vernay is best served with all types of classic meat dishes, veal, pork, beef, lamb, duck, game, roast chicken, roasted, braised and grilled dishes, tomatoes, eggplant and sausage. Domaine Georges Vernay is also good with Asian dishes, hearty fish courses like tuna, mushrooms and pasta. Condrieu, the white wine of Domaine Georges Vernay is best served with a myriad of different seafood dishes, shellfish, crab, lobster, sushi, sashimi, chicken, pork and veal, as well as Asian cuisine. Domaine Georges Vernay also produces 2 red Vin de Pays and 1 white Vin de Pays wine. For the red wines, Fleur de Mai and de Mirbaude are both made from 100% Syrah. Le Pied de Samson is produced using 100% Viognier. These are truly excellent examples of fabulous, character driven, value priced, Rhone Valley wines. Since the 2009 vintage, Georges Vernay has been on a roll in Cote Rotie. With their Cote Rotie Maison Rouge, 2009 and 2010 are the two best wines produced by the estate yet. The perfume explodes from the glass with little effort. Flowers, spice, honey, white peach, pears, apricot, sandalwood and orange peel are easy to spot. Rich and fresh, an often difficult combination is found here. The wine has weight, vibrancy and ripe, sweet, almost spicy fruits. Medium bodied, fresh and juicy, the kirsch pops, along with smoke, licorice, herbs and grilled meat. On the palate, the wine is fresh, sweet, peppery and poised. This is one of those rare wines that will drink well young, and will also improve with age. Deep in color, the oak has already been eaten up by all the fruit. On the palate, the wine is ripe, sweet, opulently textured and shows a smoky profile, with purity and silky textures. In a few years this will really be rocking! Forward, lush and sensuously textured, the wine pops with smoke, black licorice, espresso, barbecue and ripe cherries. The silky tannins and freshness in the fruits, coupled with the layers of ripe, sweet, juicy kirsch make this already deceptively easy to drink. Medium bodied, forward, soft, crisp and fresh, the smoke-filled wine shows notes of espresso, thyme, wet earth, crushed stone and red berries. Already approachable, the wine combines chalky tannins, sweet, cherry and red plum notes. Refined, elegant, fresh, soft, expressive and open, with loads of sweet, ripe, juicy, fresh berries, flowers and cracked pepper. Medium bodied and just starting to unfurl, give it a few more years. Even in its infancy, it's hard to not enjoy all the fresh flowers, kirsch, black raspberry and crisp, peppery plums. Soft, silky and with freshness, there is weight, concentration and length. Give it a few more years and it will be even better. Elegant, supple and fresh, with sweet, ripe black raspberries, kirsch, flowers, mint, spice, espresso bean, licorice, smoke and earthy characteristics. The wine is sensuous, vibrant, youthful and approachable. This is really good now and will be even better with 3-5 more years of bottle age. Bright, sharp, crisp. fresh red fruits abound here. The wine is medium bodied with a lot of lift, crushed rocks and red fruits in the finish. This is probably drinking at peak today. This is close to right where you want it to be, with its crisp, yet seductive mouth feel, nose of black raspberries, kirsch, flowers and earth and sensuous, fresh, vigorous, dark red fruit finish.